Today's snailmail brought the April 2016 issue of Analog. Stranger things have happened than spotting my name on the zine's cover (*) -- although IIRC, the juxtaposition with a dinosaur is new. 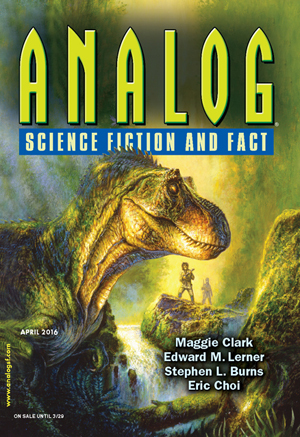 I'm quite certain that "Soap Opera," my novelette in this issue, is dinosaur-free. (*) Don't take that to mean I'm blase about it. It's an honor.